Kit is a Training Consultant with Convergent Consulting, the leading provider of cutting-edge training solutions in the Philippines. His expertise includes programs such as Building Team Synergy, Unleash Your Creativity and Innovation, Creative Problem Solving and Decision Making, Supervisory Development, Leadership Transformation, Cross-Cultural Communication, and Personal Finance and Investments Management. Our resident globe-trotter, Kit has spent over a decade traveling, studying, and working in North America, Europe, and Asia, picking up and cross-pollinating the latest and boldest ideas on human behaviour, which he brings to life in Convergent’s latest series of workshops. 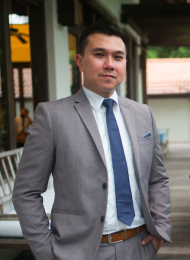 A graduate of Ateneo de Manila University, Kit spent four years in Austria while taking up his Masters in International Relations and simultaneously doing his praktikum with the United Nations Industrial Development Organization (UNIDO). He spent another two years in the Netherlands, where he finished his MBA and gained experience with the External Relations Division of the Organisation for the Prohibition of Chemical Weapons (OPCW) in The Hague. In the United States, where he lived for 5 years, Kit first started with the Training division of one of the largest investment banks in the country before becoming a fully licensed Stock Broker. He has picked the brains of people from Norway to Hungary, Slovakia to Burma, and found his passion for expanding the hearts and minds of people back home in the Philippines through training and development. Kit is also a lecturer on Organizational Behavior at the John Gokongwei School of Management of the Ateneo de Manila University. He has partnered with and conducted workshops for Nestle, Johnson & Johnson, Unilab, DMCI Homes, and Baker & McKenzie, to name a few. TetraMap is an elegant, exciting, and intuitive way of using the four elements of Earth, Air, Water, and Fire as archetypal metaphors for human behaviour. Through this workshop, participants will come to a deeper awareness of themselves and the people around them; learn to accept and appreciate their unique differences; and harness the strengths of the different elements in order to create synergies.